With so much growth in the prepaid funeral industry over the last few years, many new funeral insurance plan providers have set-up shop. Some funeral plan companies are good, others are ok, and some should be avoided…so finding the best funeral plan provider for you is well worth a bit of research. In this article take an in depth look into the funeral plan market in the UK in order to help you find the best funeral plans out there. How Safe is your Funeral Plan Money? 1. What is a Prepaid Funeral Plan? Put simply a funeral plan allows you to pay for a future funeral today. 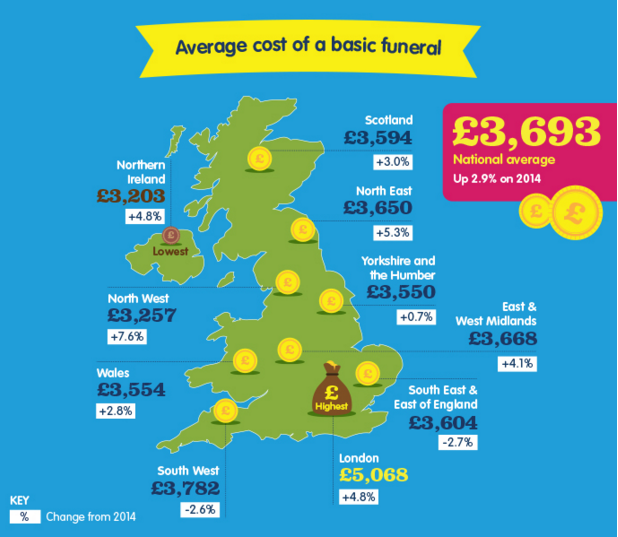 With a basic funeral now averaging over £3,693, a funeral plan can help you to ensure that you or a loved ones final send off is financially taken care of. It’s worth remembering that a funeral plan is not an investment plan as you are effectively paying for a service in advance rather than seeking to earn a return on your investment, but it is intended to shield you from rising funeral costs, i.e. you pay for the funeral costs based on today’s prices. 3. How Safe is your Funeral Plan Money? One of the most important questions for anyone interested in a funeral plan is how secure is the money that you put into your plan? It is worth remembering that your money is not protected by the FSCS (which covers your savings held in a bank up to £75,000), and also that the funeral plan industry is not currently regulated by the FCA. That said, your funeral plan provider is legally obliged to protect your money by holding it in one of two ways: Either a whole of life insurance policy, or a trust fund. Most funeral planning companies tend to use a trust fund. Both methods are intended to ensure that your funeral plan money is not used for anything other than your funeral costs. Choosing a funeral plan provider that is a member of the Funeral Planning Authority is recommended for added piece of mind. 4. Funeral Costs Checklist: What’s in, and what’s out of your Funeral Plan? Prepaid funeral plan providers usually offer a range of plans. For example, Golden Charter, offers 4 different prepaid funeral plans. To better understand what’s included in your plan, we’ve come up with a Funeral Costs Checklist. To help you to better understand the average costs involved, we’ve used SunLife’s Total Cost of Dying figures (2015). 1. Is your provider a member of the Funeral Planning Authority? Although this doesn’t provide a full safeguarding of your funeral plan, it is a sign that your chosen funeral plan provider may be reputable. 2. Which funeral directors accept your funeral plan providers plans? Not all funeral directors will necessarily accept your prepaid plan. If there’s a particular funeral director you want to use, make sure that he’ll accept your providers funeral plan. 3. Can you pay in small instalments at no extra cost? This one is really important, as a number of providers offer long term instalment plans that can see you paying a lot more into a plan than it’s actual value. 4. Ask about administration fees. Not all funeral plan providers are transparency around this subject, and our research indicates that it really can pay to ask how much of your funeral plan money will be used to pay for administration fees. 5. How many funeral plans have you sold and how many funerals have taken place? This question may sound unfair, as many good companies will no doubt pop up offering funeral plans, but understanding the experience of your funeral plan provider (including who’s behind it) should provide a little more reassurance that you are going with a well run and reputable funeral plan provider. Peace of mind: By opting for a prepaid funeral you can better plan for your funeral expenses, and ensure that your funeral costs will be taken care of. My way: By planning your funeral in advance, you can also ensure that your funeral (or that of a loved one) goes ahead the way you want it. Ring-fence funds: Purchasing a funeral plan can ring-fence some funds which might otherwise be used to pay for care fees. It’s also worth noting that a funeral plan is considered to be outside of your estate, so it isn’t included when calculating any inheritance tax liability. Funeral costs locked: One of the benefits of a funeral plan is that it allows you to pay for a funeral in advance and at today’s price, shielding you from any future cost increases. Con artists: The growth of the market has attracted the attention of scammers. Last year, a case of 50 pensioners who shelled out thousands of pounds for bogus funeral plans sold in Birmingham came to light. All the companies listed in our best funeral plan provider list are members of the FPA. A safe rule of thumb is to NOT to do business with any non-FPA member. Burial abroad: Funeral plans bought in the UK currently require the burial to take place in the UK, so if you’re thinking of a burial abroad a funeral plan might not be the best option for you. Funeral plans are not an investment product: You won’t be earning any return on your prepaid funeral plan, so it’s worth calculating if you could put your money to better use. Your money isn’t guaranteed: Unlike a savings product (or having money in your current account) your funeral plan is not protected by the FSCS (Financial Services Compensation Scheme). So should your funeral plan’s trustees invest your funds badly, there is a risk that the funeral plan provider may not have the funds to release the funds due to you. Note: If a funeral plan has been purchased, you may still be eligible for funds under the Funeral Payments scheme, for items not covered by the plan. Finding a good prepaid funeral plan is not easy, and there are certainly a few things that you need to consider. 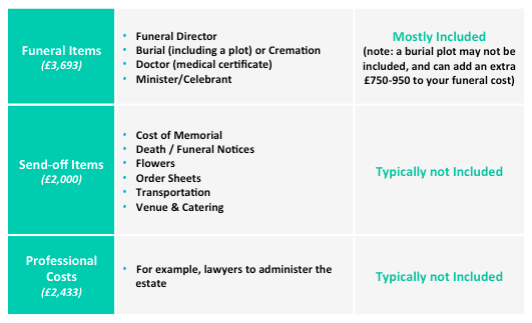 So when deciding whether a funeral plan is right for you, it’s well worth weighing up the pros and cons listed above based on your personal circumstances. And don’t forget our five essential questions to ask when looking for the best funeral plan. If you do decide to take out a funeral plan, please come back and write your funeral plan review. Together, we can help to increase trust and transparency in financial services.